Cold Call University: Courses 101 to 401 – All Courses! Most people want to do the right thing. Or, at least they try. Wouldn’t you agree? Even in the rough-and-tumble, sometimes take-no-prisoners world of sales, most folks you encounter are decent human beings. Do someone a favor, and they’ll try to return it. Maybe not right away … but eventually. People understand reciprocity. They appreciate someone going the extra mile for them. They feel valued, which fulfills a basic human need. Reciprocity is (for most) the natural response. Return the favor, right? They’re not bad people. They have reasons for their hesitation. You can learn them, and overcome. Still, this scenario can be baffling – especially if you’re a sales rep who has been conditioning a prospect, with the aim of creating an opportunity. What is conditioning? Well, as I’ve explained in recent posts, it’s carefully-orchestrated steps to build a relationship with a prospect. They start small. Grow to helping with their business. Graduate to some fun times, when you might meet their family or friends. By this time, if you’ve followed the prescribed process, the prospect should want to reciprocate. Maybe they’ll engineer an opportunity for you. Perhaps they’ll introduce you to a decisionmaker, opening the door with a glowing referral of all you’ve done for them. Or, maybe they’ll do nothing. If so, you might be bewildered. Frustrated. Perhaps even angry. You’ve spent a lot of time with this person (and perhaps money). You’ve delivered them value. You’ve proven your worth. What’s up? Well, some people – again, a distinct minority – just need a nudge. Not a guilt trip, mind you, but a recap of your relationship. Diplomacy is key. 1) Compliment: Build them up. Offer praise. “It’s been really great getting to know you.” “The company is doing really well under your leadership.” The natural response is to return the compliment … and ideally more. 2) Reminder: You’ve lent a hand. Remind them. “I’m following up on the contacts I sent you. These are the types of people you said you wanted to meet. Were they what you wanted?” If the answer is “Yes” – as you know it will be – respond with “Wonderful. Now that I know what you’re looking for, I’ll continue to seek high-quality referrals to fill your pipeline. 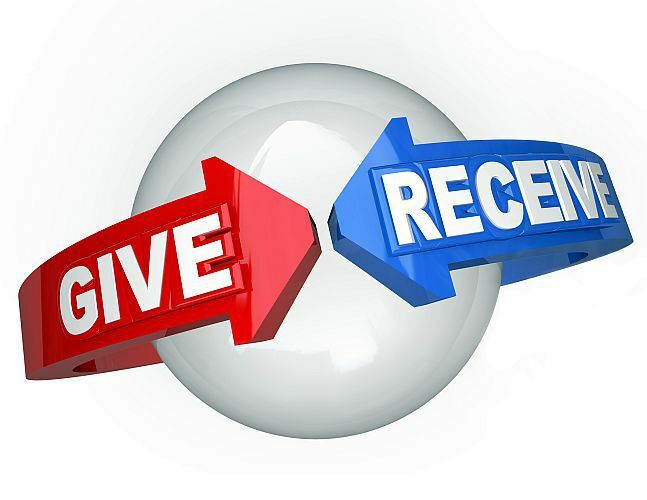 How does that sound?” Uh, great – and there’s really no excuse for not offering to return the favor. As explained in my last post, the best sales are those you don’t have to ask for. Conditioning your prospects creates a fertile environment for “no ask” opportunities. Why? Because people, by and large, are good. Most will appreciate what you’ve done for them, and willingly respond in kind. Take an extra step for the very few who don’t. Make reciprocity work for you. That five-syllable word will create the conditions for your sales success. Paul M. Neuberger is the President of The Starr Group, as well as the Founder/CEO of The Cold Call Coach. To contact Paul, call him at 414-313-8338 or reach out to him via e-mail at either pneuberger@starrgroup.com or coldcallcoachllc@gmail.com. If you get a chance to train with Paul I say run don’t walk to the session. It is invaluable and will change the way you cold call. Attending one of Paul’s seminars was one of the most beneficial experiences I have had within my educational and professional career. You will regret not signing up! Paul has such a unique yet simple approach that will forever change the way you prospect. I would absolutely recommend attending one of his seminars! Paul is inspirational, and passionate about helping people grow their client list. He has developed an easy to apply, appointment setting technique that will change the way you meet your new customers. Quit paying for clicks, advertising on social media, and paying for postage. Most people think cold calling is dead………NOT SO. Paul brings new life to the most cost effective client acquisition tool available to everyone… using the Phone! Keep it up Paul! Paul’s approach is as innovative as it is effective. Based on what I heard from him and the reactions I received from the individuals I invited, I have no doubt that people who hire him will get FAR MORE than their money’s worth. Paul is a well­spoken, direct, and impressive individual ­ His seminar and unique approach to cold calling will give you a different perspective that you can apply to your strategy immediately. I would recommend Paul’s seminar to any sales person out there, it will be worth your time! Paul is a great presenter and networker. His seminars explain how cold calling has worked for him and he gives you a methodology of how to reach out to sales prospects. I encourage you to attend a Paul M. Neuberger Cold Calling Seminar to learn how to become a more effective salesperson. Paul is also very well connected in the Milwaukee area and has introduced me to many people I have been able to do business with. Paul practices what he preaches. No matter the industry Paul M. Neuberger seminars will give you confidence that cold calling is not a thing of the past and that there is SUCCESS and GROWTH in cold calling once you have the tools to do it efficient and effective. I am a believer now that cold calling is not a thing of the past. Paul gives great tips and techniques to conduct a successful cold call. He also re­adjusts your perception on cold calling through personal stories and examples helping you get excited to get going with what you learn. Highly recommend. Executive Adviser / Culture Index "The expression "Cold Calling is Dead" could not be more far from the truth – People have simply been convinced that it no longer works based upon their experience and ultimate failures when it is not used properly. Paul’s approach and expertise in helping you script your cold call message is spot on. His method will yield results that can be measurable for your business if you let him re-teach you everything you have learned about picking up the phone and calling a cold contact. Paul takes you through a process that requires thought and relentless pursuit of perfecting your message which results in a laser focused, quality first impression cold call. Voice mail? Paul has an answer for that as well. Cannot get past the "pit bull" answering the phone? Paul has an answer for that. Thank you, Paul. You have transformed my business with your tutelage." Client Relations Administrator / Sand Castle Field Services "I just wanted to send a quick email to thank you for all the time you spent with us. I know you had to, kind of, drag us along at points, but I’m glad you did. Although I no longer sell for Sand Castle, I may find myself selling again in the future and I think everything you taught us will be useful. I can even find ways to use your tips in my current role and in my day to day life. As a side note, I just wanted to thank you for the positivity and the energy you brought to each session. It’s been a pleasure getting to know you as well. Thank you for everything!" Manager of Marketing and Property Management Business Development / Horizon Develop Build Manage "I learned so much from Paul Neuberger! Far more than just cold calling! He is truly a person that you need to know!" Chief Technology Officer / Full On Consulting "About halfway through the cold-calling course, it is fantastic. As I have just launched my own consulting firm, cold calling is critical and a skill I need to greatly improve. This course has been a blessing." Client Relations Administrator / Sand Castle Field Services "I had the privilege of participating in Paul’s program. His energy and enthusiasm made each session both interesting and enjoyable. The methods taught by Paul could easily help anyone who wants to be more successful in their sales calls. I highly recommend hiring the Cold Call Coach. You won’t regret it!" Buy The Cold Call Coach Training DVD today! To learn more, click here, or purchase your DVD here.